Secretbees Studio: Raisin Boat Treat Challenge! Hi everyone! Raisin Boat has a new challenge and this month is a fun one! 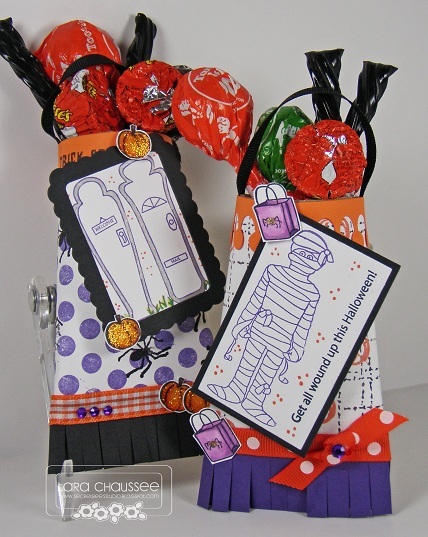 You are challenged to create a 'Treat' and Halloween is the perfect time to do this. Head on over to the Raisin Boat blog and check out what the other designers have created! Enter to win a Raisin Boat stamp set of your choice. I decided to create some treat containers out of, you guessed it, toilet paper tubes! So simple and yet so darling! Just close one end of the tube (I sewed mine) and then leave the other end open to fill with treats! I also added ribbon as a handle and then stuffed them with some goodies. 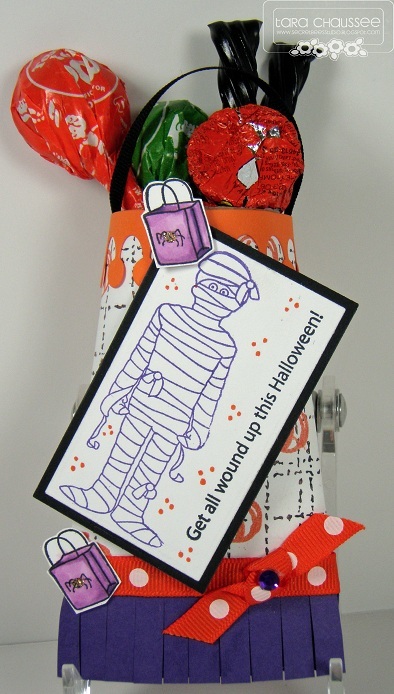 All of the stamps are from Raisin Boat and I had so much fun with the Halloween set that I used - 'All Wound Up'. This mummy is on a background of 'Need for Tweed' and there are some embossed pumpkins back there too. I also added a Monarch border from MFT Dienamics and fringed the Raisin Boat cardstock on the bottom. Some polka dot ribbon, glitter and gems complete this treat holder. 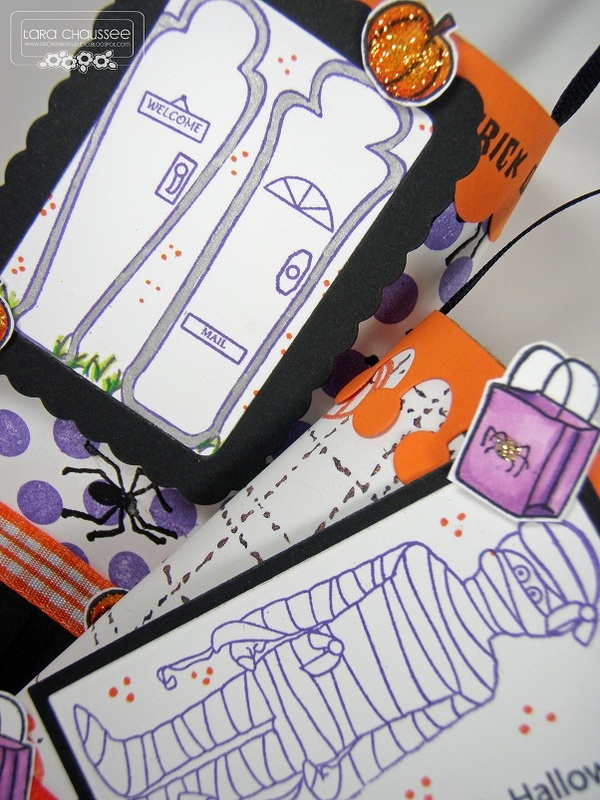 The second treat holder features some spooky doors. I wouldn't want to go into either! I used my favorite 'Polka Dots' background and added some embossed spiders from the 'Haunting Potions' set. I cut out the tiny pumpkins, glittered them up and attached them along with some festive gingham ribbon and more gems. There is a Stampin Up! 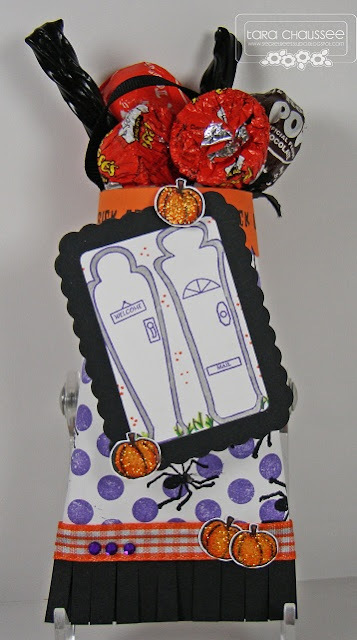 scallop border around the top stamped with Trick or Treat! I can't wait to hand these out to the special goblins in my life! You smarty pants!! These are so cool!! I wish my 7 year old's class was smaller, I would make these for everyone! Very festive, love them! Tara these are wonderful. I love the stamp set you used and the yummy candy. Love the little skirt on the bottom of the bag. Great idea.